Sun Valley Cottonwood Condo with Resort Passes! 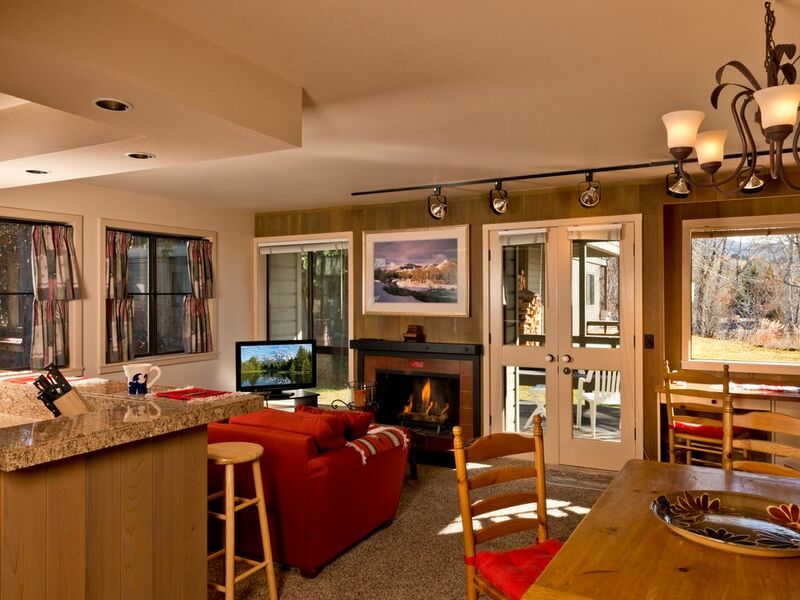 This darling remodeled single-level condominium is the perfect Sun Valley retreat! This unit is situated on the first level of the Custer Building, as you enter you will find the bedroom with a King bed and a small TV with DVD, plenty of closet space. The kitchen was remodeled complete with granite countertops, newer appliances and finishes. The living room includes a gas fireplace, a comfy sofa that is also a Queen sofa sleeper for extra guests and a 32' TV with DVD and cable. The dining area is adjacent to the living room and kitchen and seats 6 comfortably. There is a small nook in the living room with a built in desk should you need a workspace while here. There is a large deck off of the living room for the summer months. Wireless internet is offered in this condo as well. Your full size bathroom is adjacent to the bedroom. A stackable washer/dryer is located in hall for your convenience. Rental of this unit includes access to Sun Valley amenities! There are lockers at the base of the mountain for ski and boot storage so you can hop on the free shuttle in front of the complex or you can just take a stroll over to the River Run side of Baldy. The bike path runs north for 10 miles and south for 16 miles along the Big Wood River with wonderful scenery to enjoy as you walk or bike. The path is groomed for Nordic Skiing in the winter and provides access to ski to the lifts. All you need to bring for your vacation with us is a change of clothes and your grocery list. All linens and towels are provided for you as well as soap. I was born and raised in Sun Valley and went to school down the street from the condo. I currently live in San Diego and visit the condo frequently to ensure it always feels like a home away from home to all visitors. My father is a famous local photographer - please check out KirkAnderson.com for amazing photos of the valley. I love to visit Sun Valley to see family and friends and this place is the perfect place to stay and enjoy all that Sun Valley has to offer! Fully equipped with kitchen, internet, laundry - everything you will need to enjoy your stay in Sun Valley at the most affordable rate in town! One of the most popular features of this condo, apart from its amazing location right near the Sun Valley Resort Village, is that it comes with resort access to the famous 55ft diameter/ 10ft deep (in the center) hot tubs at both the Sun Valley Lodge and Inn as well as gym access at the Sun Valley Inn. There is also free high speed internet access in the room as well as free parking. Your full size bathroom is adjacent to the bedroom. Washing detergent is not included. Just across the Sun Valley ice rink and Pavilion. If you like to go to the SV Summer Symphony, this is the great place to stay, easy access to the Pavilion. You have the free bus access as well, easy to go to Ketchum and the mountains. One bedroom condo across the street from the Sun Valley ice rinks. The location and resort passes are a plus. The bed is comfortable although it has industrial type linens (similar to many hotels/motels). Sofa bed is a sofa bed- would not recommend for adults. The kitchen has everything you need - we especially liked the coffee maker and coffee grinder. The owner responds super fast to any questions, wifi worked well. Cost of rental has increased significantly recently. This is the best VRBO experience we have had. Reality far exceeded the write- up and our expectation. The condo was well equipped and spacious. Everything worked. It was very clean. The amenities at Sun Valley resort were included and just around the corner. And the owner was responsive. The only real need to contact him was to know the origin of the beautiful art in the condo. It was his Father who then gave us a tour of his gallery. Pretty awesome experience. We highly recommend this VRBO rental. Great time in Sun Valley. Casey was great to work with. The condo was perfect for our needs. Would recommend it highly. Convenient first floor condo, very comfortable. Having Sun Valley Lodge access (fitness room and hot tub) much appreciated. Wonderful condo. Comfortable and clean. We totally enjoyed our 3 week stay in Sun Valley. Golf, fly fishing, and walks to Ketchum. Casey was terrific. Great location and very clean!!! Loved our stay in SV and at this condo. Loved all the perks that came with it. And a special visitor of a momma deer and her baby off the deck.